In 2018, we saw a lot of movement towards the cloud from all software categories. But ERP’s movement to the cloud is particularly interesting to small- to mid-sized businesses. When we chatted with Laurie McCabe of SMB Group Inc., she gave us some insight as to how this may affect smaller organizations. The benefits of cloud-based ERP are numerous and often provide the most help to small businesses. Cloud-based solutions make it so small businesses don’t have to maintain their own systems, drastically reducing the need for in-house IT. This makes it possible for small companies with just one or two IT employees to take advantage of an ERP system they otherwise wouldn’t be able to afford to maintain. Of course, large companies also can reap the benefits of cloud-based ERP in a number of ways. In fact, the total cloud-based market is expected to reach $411 billion by 2020. Barring limited internet access and specific industry standards that make on-premise solutions a must, cloud software is often the better choice for big businesses looking for an ERP. To see which cloud-based ERP systems are leading the market today and a list of benefits, see this article. When we spoke to Ed Cowsar, Managing Principal of Marpaso Services, he spoke directly to the effects of cloud ERP solutions. He says, “Cloud architecture is new. Mostly it creates an ongoing stream of enhancements.” He states continuous updates can be good for companies since it reduces the steep learning curve between system versions. Cowsar mentioned one specific way in which change management owners will have to start adapting. He says, “Business intelligence begins the shift to AI [in the same way that] the database became the data warehouse and now the data lake. Your data model becomes actionable in itself and part of the living, breathing enterprise… If you define the outcomes you want from each operational activity, then each process and role in the organization can be made more agile, creating a faster cycle time for each process.” As an example of how to embrace change, he specifically recommends ERP users get all their data together and start an AI pilot project with a plan to go to production. We spoke to Nick Castellina, Director of Industry and Solution Strategy at Infor, for his thoughts on future trends for ERP systems in the upcoming year. He says, “In the future, ERP users will look for solutions that are tailored specifically to their industry so that they can avoid customization and ensure that they stay current. Instead of modifications, manufacturers will personalize their solutions and look to extend their solutions to support needs without altering code.” Castellina is backed up by Forrester’s low-code development market predictions, which place the industry at $15 billion USD by 2020. Currently, the low-code market sits just under four billion dollars. Essentially, buyers are realizing the benefits of relinquishing control over their systems, which fits right in with McCabe’s cloud prediction. Configurability might not give a company total control over every facet of their software, but this feature can provide companies with a specialized solution with very little effort. Again, this will largely reduce the need for extensive IT teams solely dedicated to managing an ERP solution. Cindy Jutras, President of Mint Jutras, was most interested in the disruption cycle when we spoke to her. She says, “We live in very disruptive times. All this disruption can have a cascading impact on business application requirements, making agility – the ability to easily innovate, evolve and change – even more important than current functionality.” Jutras continues to say vendors will need to be flexible and agile in order to compete during this time of constant change. ERP vendors should consider things like platforms, microservices and other similar components if they want to create a truly nimble system. While Jutras focuses on the flexibility of ERP vendors, she also notes that “it helps to have flexible consumers of ERP” as well. This point is especially important in the context of the other predictions within this article. As businesses give up total control of their systems for ease of use and convenience, they’ll need to learn to be flexible. Cloud-based systems make it simple to receive the latest updates and features. But it may mean businesses have to adapt their processes to the system and not the other way around. For instance, you may see better business outcomes by adjusting how you create sales orders to better align with a new ERP. Alternatively, you may find yourself coming up with workarounds to help you maintain your traditional business processes. But while workarounds typically relieve issues in the short-term, they can be quite difficult to maintain. This is especially true when hiring new employees, as they have to learn both the system and the complex way in which you use them. Not to mention that your workarounds may become null and void with updates to your system. It’s simply better to be flexible as a company and be open to changing processes. Lisa Anderson, Founder and President of LMA Consulting Group Inc., shared her thoughts on the latest ERP trends now and in the near future. Like Jutras, she touches on the disruption cycle when she says, “In today’s marketplace, not only is the Amazon Effect is full force — requiring rapid deliveries and quick, data-driven decisions — but disruption abounds.” Anderson says her clients in the last year have attempted to navigate these challenges using business intelligence and reporting tools. But she also notes many are eager to try more advanced solutions. “They have started to gain an interest in going beyond these new standards with predictive analytics as artificial intelligence and IoT create a buzz and are increasingly interested in capabilities that will help them proactively navigate disruption and change.” As ERP buyer interest grows, it’s likely that we’ll see an increase in these new technologies. Especially with equipment, IoT can help businesses diagnose issues and figure out which exact parts need fixing or replacement. This ensures every service call is used as efficiently as possible. IoT can help with corporate equipment, as well as the equipment housed by consumers. 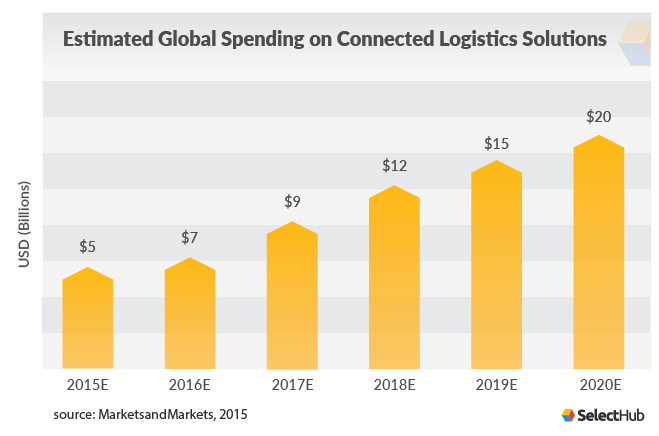 This makes IoT an especially important tool in increasing customer satisfaction. According to a 2018 ERP report by Panorama, 95 percent of businesses reported process improvement after implementing an ERP system. But in the same report, the vast majority of respondents only realize 30 to 80 percent of their projected benefits. So while ERP is clearly beneficial, it’s not living up to its reputation. This is largely due to an overemphasis on back-office functions during implementation, such as accounting and HR. However, when we spoke to Eric Kimberling, CEO and Founder of Third Stage Consulting Group, he believed this would change in the new year. He says, “Digital transformation will begin focusing less on ERP and more on the ‘last mile.’” Many companies want the advanced features and functionality ERP solutions offer, such as predictive analytics, BI, eCommerce tools and more. But Kimberling says too often, businesses underestimate how long and costly an ERP implementation will be, forcing them to omit these modules from the final system. Another reason businesses fail to focus on the last mile is simply due to low energy. 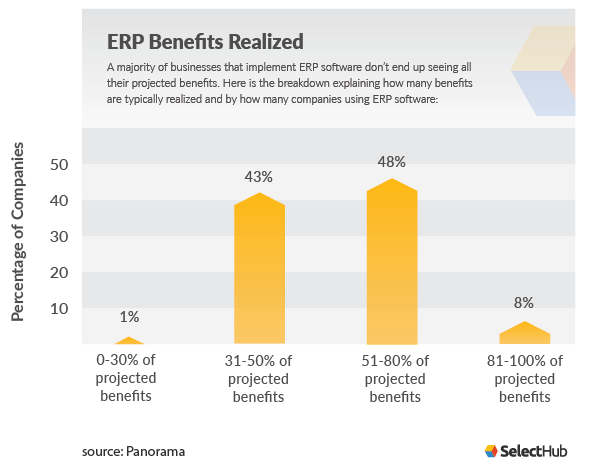 After implementing the basic ERP package, many just want to call it quits. Kimberling advises companies need to have realistic expectations in addition to creating a more in-depth digital transformation plan before implementation. Following these guidelines can help businesses access the full potential of their ERP implementations. Based on what we’ve learned, future ERP trends indicate we’ll see buyers move to the cloud as vendors offer personalized solutions with continuous updates. This means companies investing in an ERP solution will have to learn to be more flexible as the disruption cycle gets shorter. We’re also seeing companies take interest in new technologies such as AI and IoT as competition in the supply chain ramps up. In order to accommodate all these new features and challenges, companies will have to put more effort into ERP implementation than in years past. In order to carry out a successful implementation, it’s imperative buyers perform thorough research on today’s ERP market. You need to understand which products suit the size of your business, cater to your industry, provide all the features and functionality needed, along with which ones can help your business field the challenges of both today and tomorrow. Once you understand the options available, it’s time to compare ERP solutions. It’s important that your comparison is organized and thorough, much like our own ERP comparison scorecard, which evaluates and ranks the top vendors by 19 different benchmarks. However you end up comparing your top systems, make sure to find the best solution and help your company succeed in the new year. Laurie McCabe brings more than 25 years of experience in the IT industry to her current role as Cofounder & Partner, SMB Group. Laurie has built widespread recognition for her capabilities and insights in the small and medium business (SMB) market in several areas, including cloud computing, mobile solutions, business solutions, social networking and collaboration, and managed services. Ed Cowsar has built a career improving businesses by leveraging best practices, technology and professionals engaged to manage change in client organizations. He has a depth of experience in growing markets, improving teams, and creating competitive advantage. Leadership and management of sales, services and marketing while significantly exceeding expectations are a hallmark of his career. Nick Castellina is the Director of Industry and Solution Strategy at Infor for discrete manufacturing. Prior to Infor, Nick was Vice President and Research Group Director of the Aberdeen Group’s Business Planning and Execution research practice. There he worked with software vendors and end users to analyze trends and produce industry-leading content in topics related to ERP, EPM, PPM and BPM. Cindy Jutras is a widely recognized expert in analyzing the impact of enterprise applications on business performance. Utilizing over 40 years of corporate experience and specific expertise in manufacturing, supply chain, customer service and business performance management, Cindy has spent the past 13 years benchmarking the performance of software solutions in the context of the business benefits of technology. Lisa Anderson is the founder and president of LMA Consulting Group Inc., a consulting firm that specializes in manufacturing strategy and end-to-end supply chain transformation that maximizes the customer experience and enables profitable, scalable, dramatic business growth. Ms. Anderson has been named a Top 40 B2B Tech Influencer by arketi group, a 50 ERP Influencer by Washington Frank and ranked in the top 46 most influential in Supply Chain by SAP. Eric Kimberling is one of the most recognized and respected independent ERP systems experts in the world, giving unbiased advice to clients for over 20 years. Eric has been quoted in thousands of articles in newspapers, magazines, and books, including the Wall Street Journal, CIO Magazine and Fortune. He has served as the expert witness in the industry’s highest-profile legal cases, representing both government and private companies across the globe.